Look I have just made these. 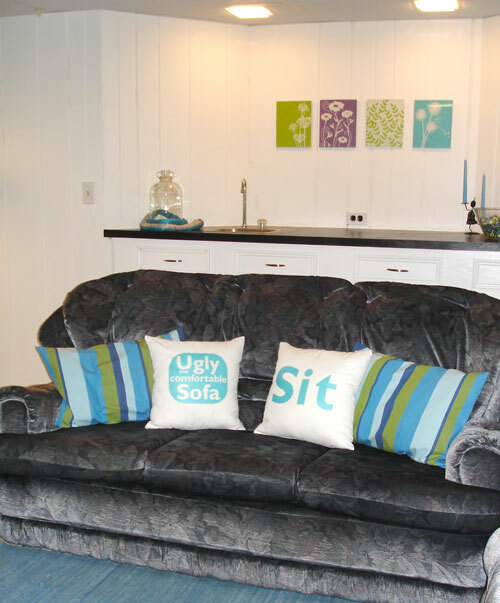 You have a really really ugly sofa in your basement. The other day when I revealed your wet bar corner one of the photos showed just a wee corner of it. That was about all I wanted to show. The sofa is old, a bit saggy and has lived in three countries (how many sofas have endured a cargo ride across the English Channel, the Atlantic and lived to tell the tale?) The thing is that it Mr Chicago House loves to snooze on it, he says its the most comfortable catnap spot in the house. He is not ready to part with it. So it is banished to the basement. I have considered making it a slip cover but I think that would be like putting a bow tie on a pig. I ironed the designs onto simple throw pillow cases made from curtain lining I removed from all the disgusting drapes originally in the house. They make the sofa a little better don’t you think? So anyone else been up to a fun DIY project this week. Add your projects to my linky party! 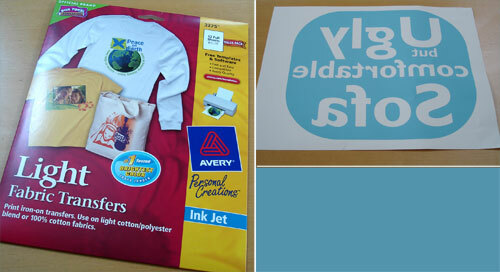 This entry was posted in Craft Projects, Decorative Accents, Home Decor, Sewing. Bookmark the permalink. Your pillow made me giggle. Very cute! I'd love it if you'd link this up to my Home and Family Friday linky party! 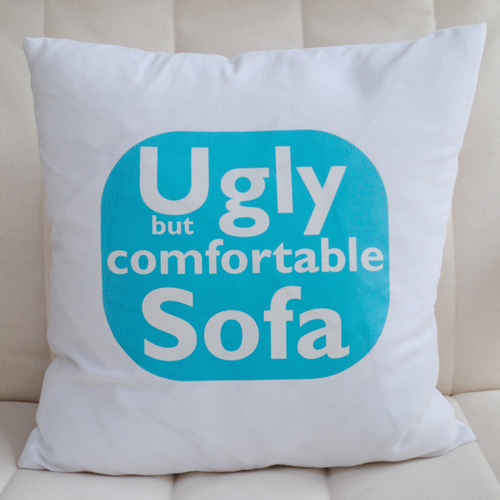 Your ugly but comfortable pillow made me giggle! 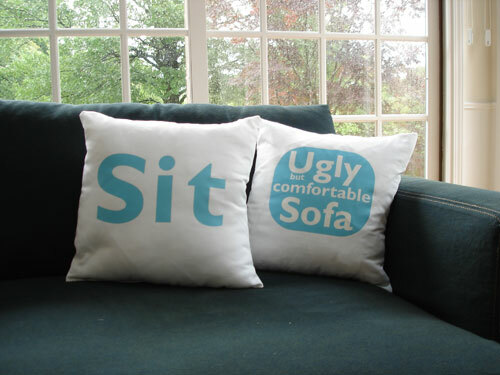 And your couch may be ugly but your pillows are super cute! You did a great job! Thanks for joining my Bunny Hop. A bow tie on a pig…haha! I love this! SO happy you linked this up at my turquoise lovin' party!! Hope to have you back again soon! This is such a great idea! 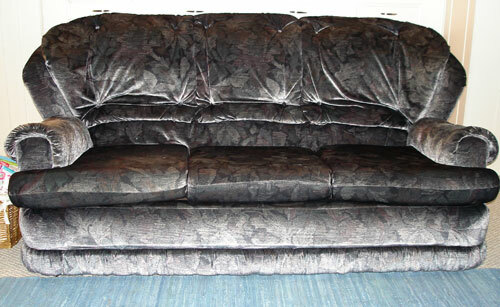 It makes me remember the ugly sofas my impoverished family had to deal with in the early years! Embrace it! Totally linked you today! 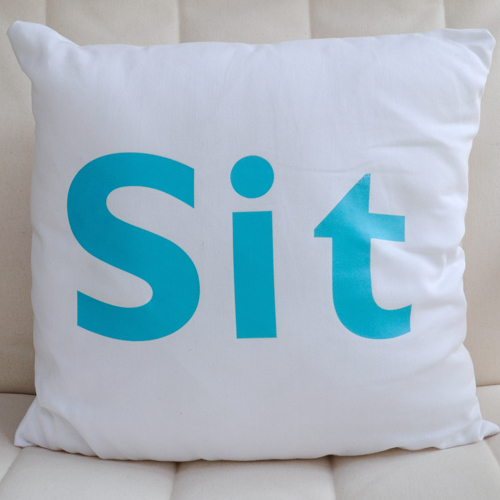 I'm sorry but I just had to stop by and comment from icandy handmade and tell you how much I LOVE these pillows! They are adorable and hilarious! 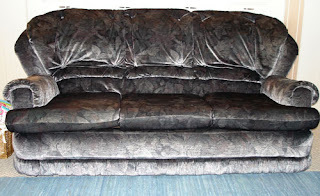 Thanks for visiting my post on sofas! 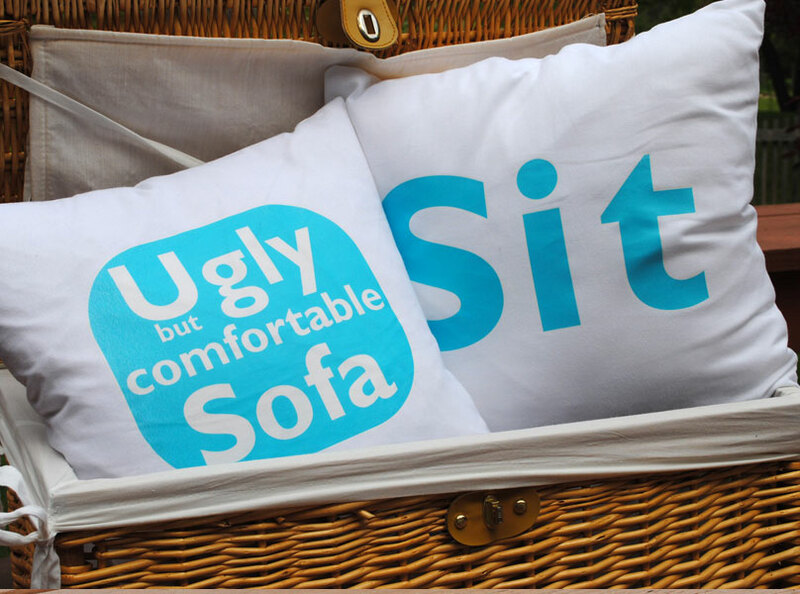 Perfect place to add your link to this ugly sofa and cute pillow! Too funny! I think many of us have one of those monsters in the basement and your pillows ad a little whimsy to the ugly. Would that be whugly? Or ugmsy? Hehe. Visiting from The Cottage Market Pillowpalooza. Thanks for linking to the Pillowpalooza party!